NEW YORK, November 2, 2017 /3BL Media/ – JetBlue (Nasdaq: JBLU) today announced it will celebrate a month of kindness and good in November with JetBlue For Good Month. 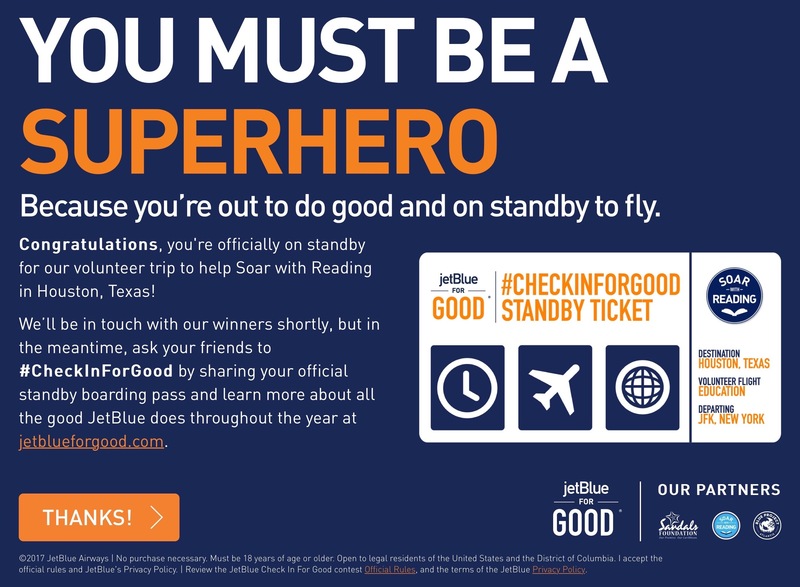 Throughout this month of philanthropy and giving, JetBlue is asking customers to #CheckInForGood and enter to win a complimentary trip to volunteer with some of the airline’s non-profit partners (a). The winners will participate in trips focusing on the three pillars of the JetBlue For Good platform: youth and education, community and the environment. ​​Like many in Texas, the Houston Public Library (HPL) is still reeling from the impact of Hurricane Harvey. Seven branches remain closed due to storm damage, leaving these communities without access to the libraries’ vital programs, services and books resources. Building on JetBlue’s signature Soar with Reading literacy program, designed to inspire and encourage kids' imaginations to take flight through reading, volunteers on this trip will check in with elementary schools in communities which have been impacted by Harvey, have low literacy rates and where their libraries are still closed. While the Mobile Express, HPL’s library-on-wheels hits the road to distribute free books, volunteers will help operate “pop-up” libraries and host reading events, with books donated in partnership with Simon & Schuster Children’s Publishing. JetBlue will also bring its innovative free book vending, powered by IVS, to Houston to distribute 25,000 children’s books throughout the remainder of the year. The Sandals Foundation, the philanthropic arm of Sandals and Beaches Resorts, is committed to improving the lives of its local communities, supporting schools, facilities and centers across eight islands in the Caribbean. The Eltham Community Centre serves the rural area surrounding Ocho Rios region. Here, neighbors can gather for recreational activities and informative workshops, receive mentorship and gain access to free mental and dental care as well as spay and neuter services for animal clinics. Volunteers on this trip will help paint, renovate and restore The Centre with upgrades to ensure it can continue to be a safe, healthy and inspiring space for both the young and elderly in the community. ​The Bahamas is home to one of the largest coral reefs in the world. Its sustainability is vital to the marine ecosystem as reefs provide food and shelter for a vast array of marine life in addition to protecting shorelines and preserving beaches. Led by marine ecologist Dr. Craig Dahlgren of the Atlantis Blue Project Foundation, an organization developing innovative ways to protect Bahamian waters and wildlife, volunteers on this trip will participate in an ongoing coral nursery project on Paradise Island and assist with harvesting and out-planting coral, in addition to activities at the dolphin sanctuary. 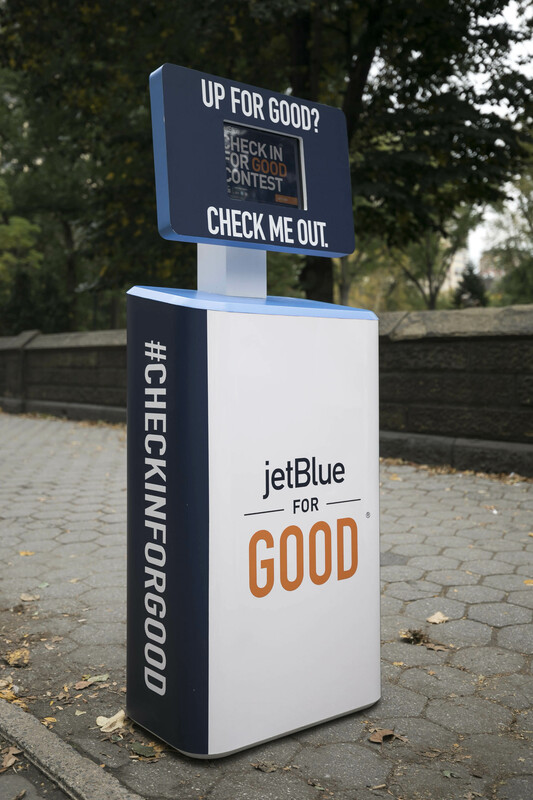 The first 2,000 entrants who #CheckInForGood will receive donation codes to donate to a charity of their choice at globalgiving.org/jetblue. Entrants who are selected as winners from the “standby” list for one of the volunteer trips will be notified of their eligibility on a rolling basis through November 20, 2017. Community - This fall, JetBlue and KaBOOM! will continue to bring play to kids in areas of need. In October, JetBlue funded and built a playground in Boston, and in November, the airline will restore play for some children in New York City and Los Angeles. To date, JetBlue has completed 28 playground builds helping to restore play for more 60,000+ children throughout the airline’s network. JetBlue is also a KaBOOM! national partner, a group of organizations providing long-term guidance and support to KaBOOM! and its mission to promote and protect a child’s right to play. Environment - JetBlue believes good climate governance and leadership is important for the success of the aviation industry. JetBlue recently signed one of the biggest renewable jet fuel agreements in history and to date has offset more than 1.7 billion pounds of CO2e emissions. Youth/Education - In 2011, JetBlue launched Soar with Reading to encourage kids’ imaginations to take flight through reading. Since its inception, Soar with Reading has supplied more than $2,750,000 worth of books to kids in need. Last summer, the program visited Fort Lauderdale and will land in San Francisco in 2018. JetBlue also recently announced the 100x35JetBlue initiative, the airline’s immediate and long-term commitment to Puerto Rico hurricane relief, including 35 initiatives over 100 days – and beyond – to support the needs of crewmembers, customers and communities in Puerto Rico. For more information, visit http://blog.jetblue.com/100x35jetblue/. 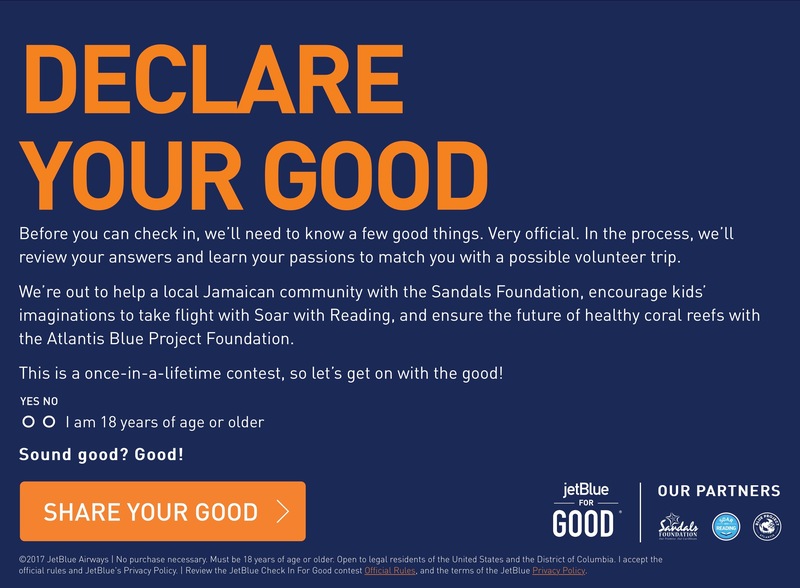 JetBlue For Good is JetBlue’s platform for social impact and corporate responsibility. Giving back is part of JetBlue’s DNA and is core to its mission of Inspiring Humanity. Centered around volunteerism and service, JetBlue For Good focuses on the areas that are most important to the airline’s customers and crewmembers - community, youth and education and the environment. 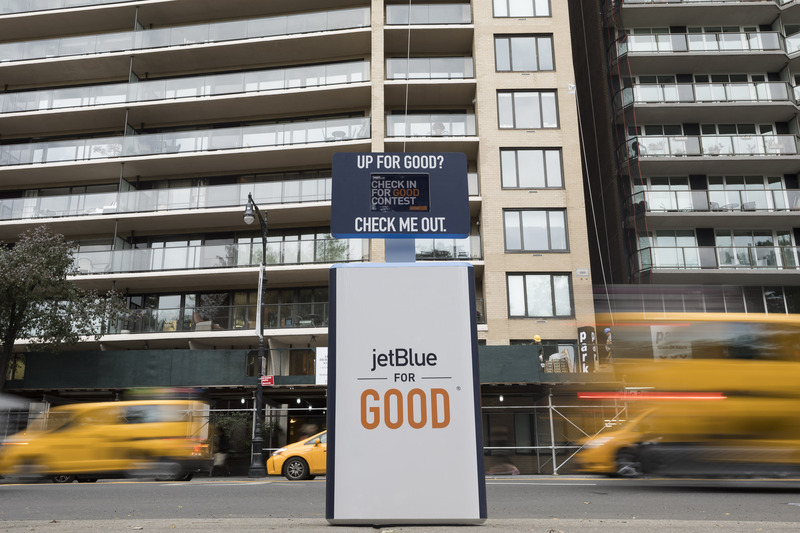 Combining JetBlue’s corporate efforts with its customers’ and crewmembers’ passions, the common theme is Good – JetBlue For Good. Join the #JetBlueForGood conversation on Twitter, Instagram and Facebook, check for regular updates and get involved. For more information about causes supported by JetBlue customers and crewmembers, or to learn more about JetBlue For Good, visit jetblueforgood.com. JetBlue is New York's Hometown Airline®, and a leading carrier in Boston, Fort Lauderdale-Hollywood, Los Angeles (Long Beach), Orlando, and San Juan. JetBlue carries more than 38 million customers a year to 101 cities in the U.S., Caribbean, and Latin America with an average of 1,000 daily flights. For more information, please visit www.jetblue.com. Atlantis Blue Project Foundation (ABPF) is a private nonprofit foundation that fosters the preservation and conservation of coral reefs, sea turtles, sharks, manatees, and cetaceans, along with their Bahamian ecosystems, through scientific research, education, and community outreach. For more information visit our website at www.BlueProjectAtlantis.org. The Houston Public Library (HPL) operates 35 neighborhood libraries, four HPL Express Libraries, a Central Library, the Houston Metropolitan Research Center, the Clayton Library Center for Genealogical Research, The African American Library at the Gregory School, and the Parent Resource Library located in the Children’s Museum of Houston. With more than eight million visits per year in person and online, HPL is committed to excellent customer service and equitable access to information and programs by providing library customers with free use of a diverse collection of printed materials and electronic resources, Internet, laptop and computer use, and a variety of database and reference resources with live assistance online 24/7. For further information, visit the Houston Public Library at www.houstonlibrary.org, on Twitter @houstonlibrary, on Facebook – houstonlibrary – or call 832-393-1313.